As a teenager in the 90’s I still from time to time find myself breaking into “WOOOAAAAA BODYFO-ORM, Bodyformed for YOUUUUUU”. One of the worst series of adverts ever but alas with a rather catchy jingle if you love a good rock song like me. 25 years on though, the subject of periods is still a fairly hush-hush one. We’re meant to either battle through it or zoom around on roller skates in the tiniest pair of white hot pants. Say what? I’m probably one of the lucky ones that has never really been affected by ‘surfing the crimson wave’. Yes I may get slightly more emotional and cry even more at animal videos than normal but that’s about it. Aside from all the years when those telltale signs were a constant, painful reminder that I wasn’t going to be a Mum. Now I’ve realised it’s because I’m destined for a different future. But no matter what the circumstances, everyone deserves a monthly treat and that’s where Eve’s Parcel comes in. 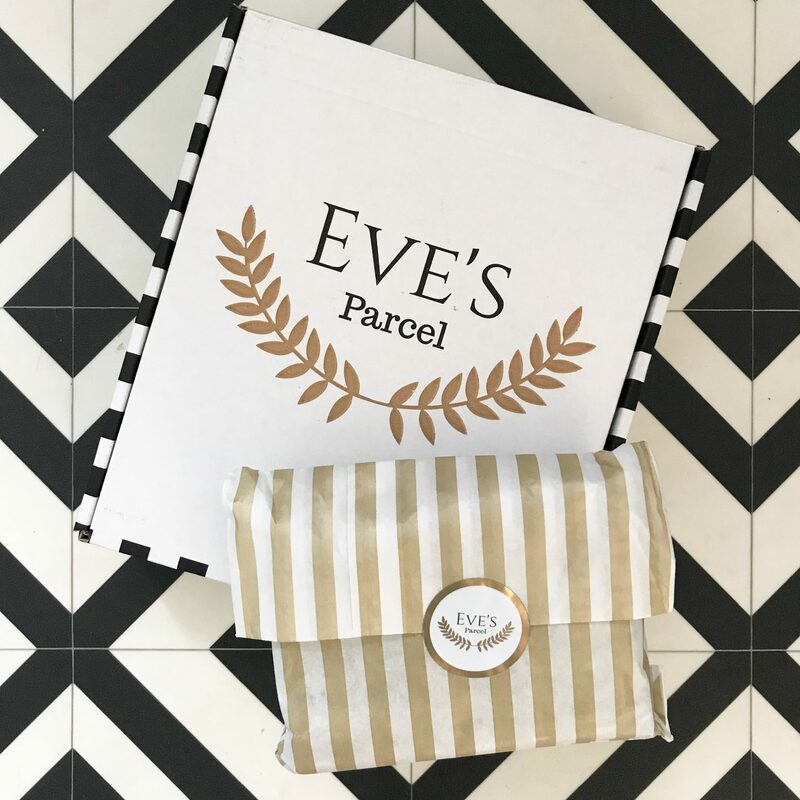 A monthly subscription box, Eve’s Parcel tailors its contents to your personal choices. 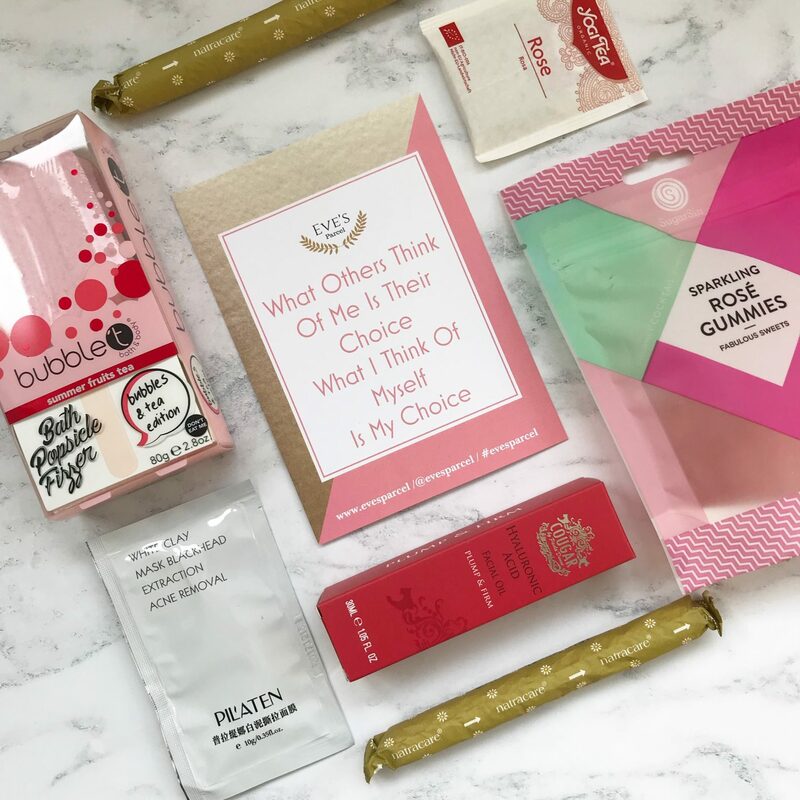 You can choose your sanitary wear be it tampons, sanitary towels, a combination or – if for whatever reason you don’t have periods and so don’t require the products – just a subscription box of lovely treats once a month. So let’s take a closer look at the Eve’s Parcel box. Firstly, it’s stylish. Black and white stripes with a gold logo and black tissue paper inside. There is a monthly yoga position and a monthly positive affirmation statement, both of which I love. I’m a bit of a yoga novice but am finding my way back to health and fitness after a very difficult year so both the guided movements and reminders to take care of ourselves are super valuable. Having not really subscribed to any boxes like this previously, I don’t have anything to compare it to. 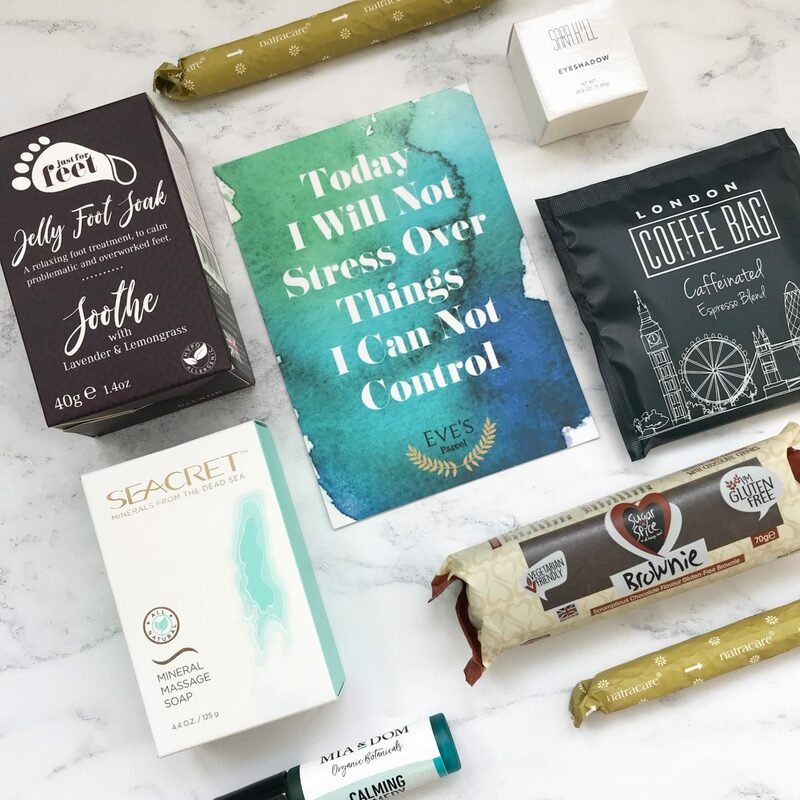 I do know that it felt very much a treat to open and read about all the products and for £12.99 including the sanitary wear, it feels very much like good value for money in my opinion. BUT I didn’t stop there. Whilst this first box was very kindly gifted by Eve’s Parcel, I do currently have a subscription and received my second box (paid for) to see how it compared to the review one. And I’m delighted to say it was just as good – an eye shadow, a foot scrub, a mineral soap bar, a CHOCOLATE FUDGE BROWNIE (! ), a calming pulse point oil, a coffee bag and another yoga move and positive affirmation statement. If there is just one teeny requirement from a selfish perspective, it would be to be able to select vegan for the subscription boxes. The edible treats are so lovely but rule out both vegetarians (in the case of gummy sweets) and vegans and for the skincare also, just to ensure that everything is completely cruelty free. That for me would be the absolute icing on the cake in ensuring that luxury is also ethical. Disclaimer: Eve’s Parcel have kindly gifted me a review subscription box. As always, I only ever accept product from a brand I either already do use or would love to be associated with.